The Tospovirus Iris yellow spot virus (IYSV), transmitted by thrips (predominantly Thrips tabaci), was first recorded in New Zealand in 2007. In March 2015, symptoms of the virus were relatively widespread in an organically managed onion crop in Canterbury. 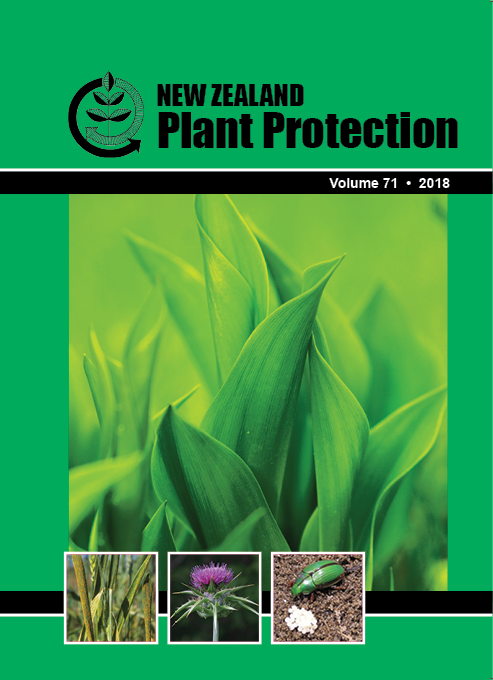 Onion plants were sampled for the presence of T. tabaci adults and larvae and for IYSV symptoms on an organically managed farm in Canterbury in 2014-2015, 2015-16 and 2016-17, and on a similar farm in Hawke's Bay in 2014-2015 and 2015-16. An immunoassay was used to confirm the presence of IYSV in some symptomatic plants. In Canterbury, IYSV symptoms were less apparent in 2015-16 and no symptoms were observed in 2016-17. No IYSV symptoms were observed in the Hawke's Bay onion crop, despite relatively high T. tabaci numbers. The virus symptoms declined from when they were first observed in March 2015 to undetectable levels in 2016-17 in Canterbury, which may be attributed to crop location, fewer thrips and the absence of a disease reservoir in volunteer Allium cepa plants or other hosts.